Gears are utilized to transmit motion and power between shafts. Gears can be found in virtually every industry, including: packaging, material handling, conveyors, machine tools, indexing, food processing and construction. For proper functioning, all gears must be accurately aligned and supported. Gears are available in many materials, such as plastic, non-metallic, brass, steel and cast iron. Spur Gears transmit motion and power between parallel shafts. Different styles include spur, gear rack, pinion wire, stem pinions, and internal gears, and most come with a selection of bore diameters, keyways, and setscrews to accommodate a wide variety of application requirements. Spur Gears are the most cost effective style of gearing. Helical Gears utilize a 45 degree helix angle to transmit motion between non intersecting shafts that are parallel or at 90 degrees to each other. 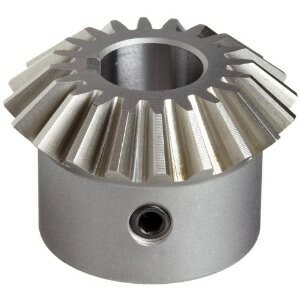 This type gear provides a smoother, quieter operation and higher horse power capacity over a spur gear. Miter and Bevel Gears are designed to transmit power and motion between intersecting shafts at a right angle. Miter gears operate in pairs at a 1:1 ratio and have the same number of teeth. Bevel Gears are available in sets with ratios of 1-1/2:1 to 6:1. Worm Gears are utilized in power transmission applications requiring high ratio speed reduction in a limited space. The gears are used on right angle, non-intersecting shafts. When properly aligned, worms and worm gears are the quietest and smoothest form of gearing. One drawback of worm gearing is as the ratio of this gearing increase, the efficiency of the gearing decreases.